What is the Windows Update Fix for Win9x/Me? "Thank you for your interest in obtaining updates from our site. This website is designed to work with Microsoft Windows operating systems only. 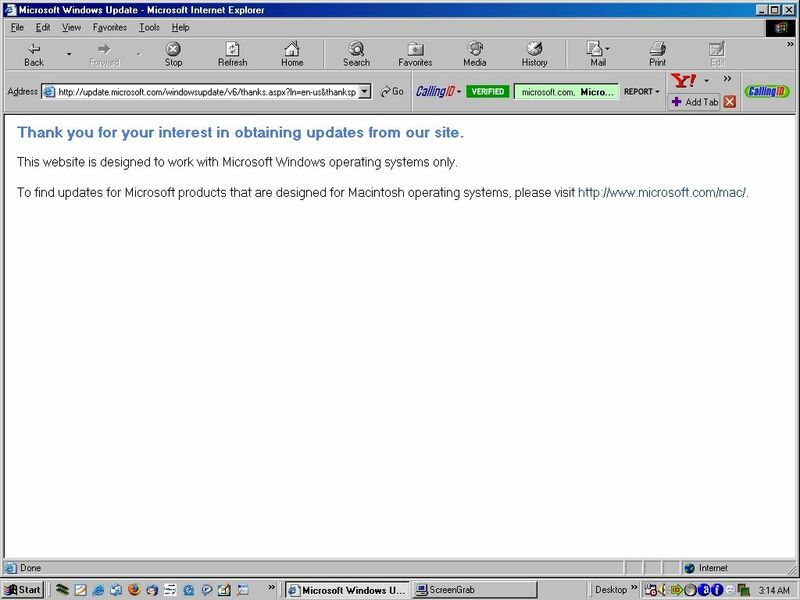 To find updates for Microsoft products that are designed for Macintosh operating systems, please visit http://www.microsoft.com/mac/"
The Windows Update Fix for Win9x/ME will hopefully fix this problem. It re-installs the files needed for Windows Update to work, and also installs the recently released root certificate updates which seems to be the cause of the problem. While it has only been primarily tested to work using a Win98SE (English) machine, this fix should work for the entire Win9x/ME family, including localizations in other languages. Windows Update Fix for Win9x/ME has already been confirmed to work on at least 5 localised editions of Win98SE. if you double-click the file it extracts to a temp directory, runs the program (with menu options and everything, and then deletes itself after its all done. Hi, here's a tool that should fix WU. It's only been tested on Win98se but I can't see why it won't work for the entire Win9x/Me family. There are two fixes contained because it seems there are 2 conditions that will stop you accessing WU. You use FIX 1 first and if that doesn't work, FIX 2 will work. That's what my testing revealed. 1) only do step 2 of FIX1 --- why this works is beyond me. This file: Additionally, a 404 Not Found error was encountered while trying to use an ErrorDocument to handle the request. Thx. I download with link http://www.iinet.net.au/~hiandy/WU_fix_v1.01.zip, thx. Works fine on Windows 98 SE Italian. None of these URLs work for me. Could you upload this file somewhere else, please? -- nothing crucial was added, so those with v1.00 don't really need to upgrade. :thumbup I try install this utils (1.01) into Windows 98 SE / Czech (!) - working, OK! Thx! I send you in attachment runme_it.bat (replace .txt with .bat) translated in italian language to put in WU Fix 1.01, to share this utility in a italian community. Naturally I leave each credit about your work. I'm on it. Localizations are fun !! I've also improved the fixes a little, fix 2 sometimes needs to reboot to work properly. EDIT2: to avoid having to type in your local equivalent of 'Program Files' if you tell me what it is, i'll include it in the code. ::  so you don't have to translate each line perfectly as it is. SET Tex09=the folder was found. SET Tex11=the first one should work for most people. EDIT4: Max_04 i sent you a PM re: more translations, it doesn't matter now. Programmi is the italian entry of default for italian systems. EDIT2: to avoid having to type in Already done! thanks for that ... can you check this? For the rest, all ok.
* improved the Italian localization - uses the default Program Files folder. I've noticed that your batch prompts the user for non-default "C:\Program Files" folder location. This can be accomplished easily without any prompts, thru command line Windows Script detection [using cscript.exe]. This way detection works always 100% no matter where the user has "C:\Program Files" [even on another drive/partition], and LFNs are also properly supported. This script uses also EXTRAC32.EXE, START.EXE + GETVER.EXE .